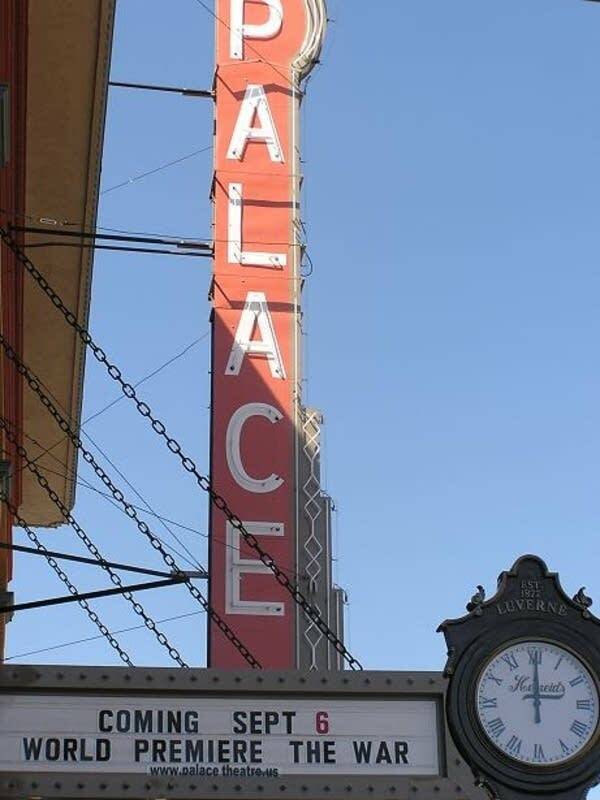 On the marquee of the Palace Theatre in downtown Luverne, black letters spell out what's become the talk of the town. "Coming Sept. 6, World Premiere, The War." 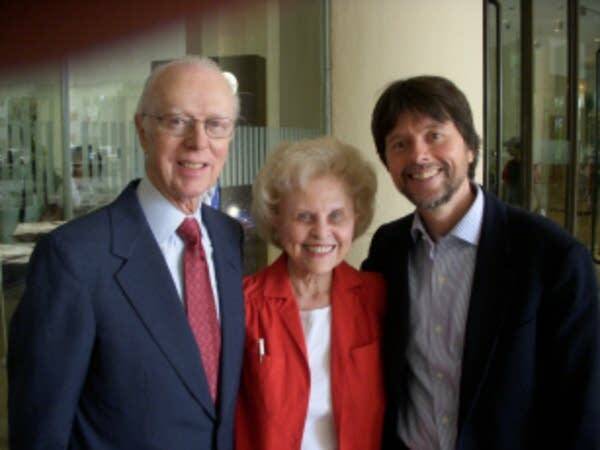 Among the special guests will be military veterans and their families, and film director Ken Burns. 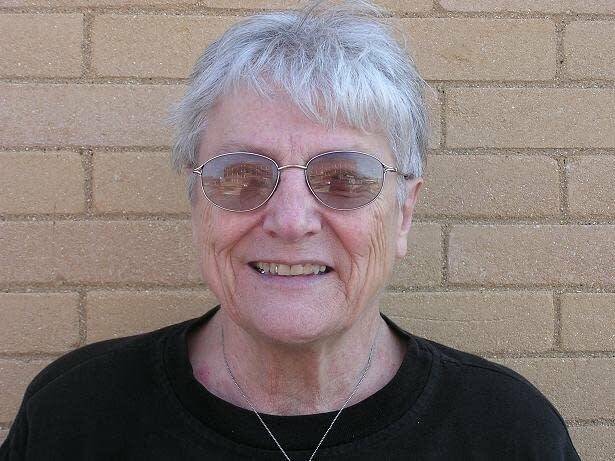 Standing on main street outside the Palace, local historian Betty Mann says Luverne plans to stage a real Hollywood-style premiere, including a parade. "We're going to have a red carpet from this corner into the theater," says Mann. "The parade will come down this street, and the dignitaries will be let out of their cars and they'll walk the red carpet into the Palace." Inside the theater, workers spent the days before the premiere finishing a major refurbishment of the Palace. Mann says the town is getting ready for an event that will have a lasting impact. "I think that we're all just kind of numb, to be so recognized right now," says Mann. "We're not used to that." The pathway to that recognition began with a proven movie-making practice, the strong audition. The decision to make the town of Luverne a leading player in "The War" actually had its origins in an earlier film. 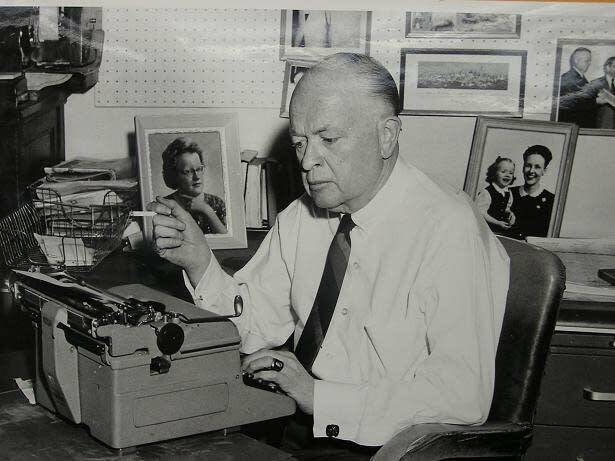 Luverne native Quentin Aanenson wrote and narrated "A Fighter Pilot's Story." Public television stations around the country broadcast Aanenson's film a decade ago. In the documentary, Aanenson says he made "A Fighter Pilot's Story" at the urging of his children. "It has been a traumatic experience for me to go back through all this," says Aanenson. "But perhaps in other ways, it has helped purge some of the devastating memories that have haunted me for almost 50 years." His documentary caught the eye of film director Ken Burns when he was researching what would become "The War." During an interview on MPR's Midday program, Burns said he became intrigued with Aanenson's war stories, beginning with D-Day, the invasion of France. "His first day of work was June 6, 1944," says Burns. "And for the next 10 months what he saw is nearly impossible to contain. You can't imagine that a single life could have gone through what he went through." Al McIntosh Photo courtesy of the Rock County Historical Society. Burns says his interest in Aanenson lead to more research. His investigation led him to the fighter pilot's home turf, the farm fields of Rock County -- and specifically the city of Luverne. In the back files of the Luverne newspaper, Burns found another star for his film. "We discovered in the archives a man named Al McIntosh, who had been the editor of the Rock County Star Herald," says Burns. "A North Dakotan who'd turned down big city jobs and ended up in Luverne sort of watching, omnipotently in a way, as if he was a god -- the Greek chorus for our film at least -- watching the doings of this 3,000 population little town." Burns says he found the soul of his film in McIntosh's writings. McIntosh's newspaper columns, read in "The War" by actor Tom Hanks, help frame how World War II played out on the U.S. homefront in the 1940s. 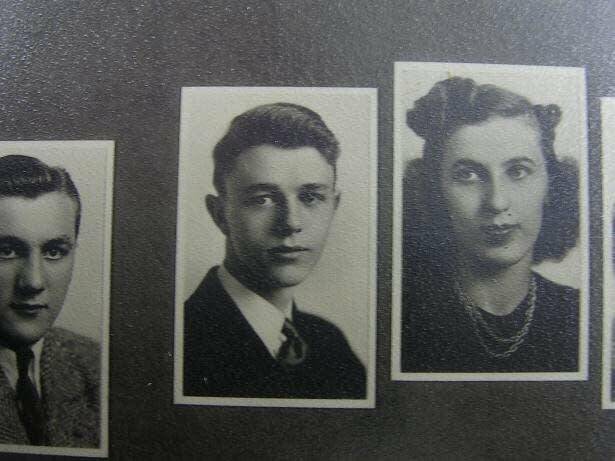 Luverne historian Betty Mann helped Burns and his team with their wartime research. She says in that research she found that local residents contributed to the war effort. For example, she says in a typical countywide war bonds drive, the average adult gave more than $100, which was big money in those days. Mann says residents also gave material items. "They had physical drives for tin and steel and iron and rubber," says Mann. "People donated a lot of themselves to that war." That sense of commitment and support on the homefront helped keep the soldiers, sailors and pilots motivated through the hellish years of war. For pilot Quentin Aanenson, combat brought moments of intense anguish. In a clip from "The War" posted on the film's Web site, Aanenson remembers one mission when his plane's machine gun fire sent the bodies of German soldiers flying. 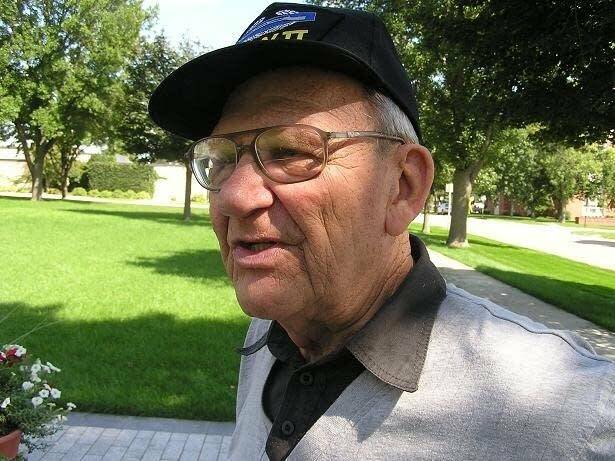 "When I got back home to the base in Normandy and landed, I got sick," says Aanenson. "I had to think about what I had done. Now that didn't change my resolve for the next day. I went out and did it again and again and again and again." Dealing with those sorts of memories is something veterans of all wars go through. 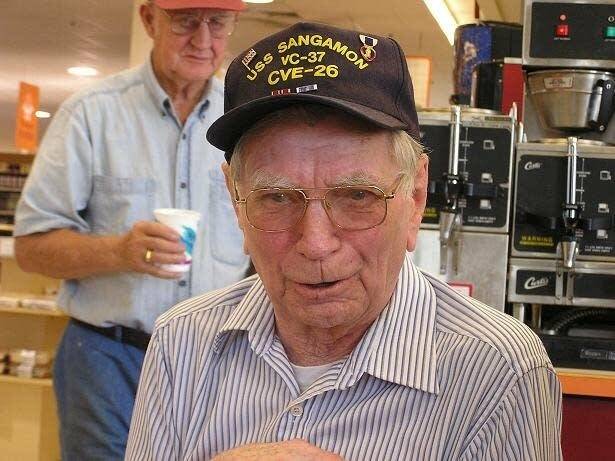 At a Luverne grocery store several days before the film's premiere, a group of mostly World War II veterans get together for afternoon coffee. There's a lot of joking about how the film will put Luverne in the national spotlight to the envy of neighboring towns. But then the talk turns serious. Johnny Johnson served in the Navy. His ship was struck by a Japanese kamikaze plane, a suicide bomber. "I was five decks below there, and we were trapped in that little room, 10 by 10," says Johnson. "The flames burnt my hair all off." The fire also seared Johnson's eyes before he could make his way to safety. He was blind for a time, but after several months his sight returned. Johnson says the new film will help people understand the sacrifices war veterans made to preserve the nation's freedom. Another theme emerges from the circle of coffee drinkers. Warren Herreid says the new film will play an educational role. He says he cringes when he hears people talk inaccurately about World War II, like those who deny the Holocaust happened. "My regiment liberated the concentration camp at Landsburg, Germany," says Herreid. "The Holocaust did happen. I've got proof, I saw it." Herreid says images of what he describes as the living skeletons inhabiting that camp are still scorched in his memory. Herreid says if the film helps keep the historical record about World War II accurate, it will serve a valuable purpose. That far-flung record will include all the major combat zones of the war. The film will also document the homefront. The sense of purpose and pride Luverne residents felt was duplicated all across the nation. A latter day group of citizens from that town believes that's a lesson that's still valuable.